June already?! Summer is here. There's no getting around it. I spent so much time working on house projects this month, I figured I wasn't very productive in the sewing department. So not true! This was such a cute quilt. It came together without any surprises, even though my brain did all of the quilty math. Always risky. I would happily use these organic Monaluna fabrics in another project. Another month with only one completed block. This one's not my favorite. My design skills are limited. I've added a few fat quarters to my stash to give me additional design options, though. This can only help. This is the secret to Rose Star block success: lots of paper templates. Why? If you have plenty of templates on hand, then you can get to designing! If I can do the design work ahead of time, The Clubhouse only has to be in a state of utter destruction for a brief period of time (currently in its second week). If I can stockpile designed blocks that are ready for sewing, then I can knock out the fun sewing part whenever I have found time: while getting an oil change, while sitting through the same light for a third time in traffic, or while Mr. Pins watches action movie trailers on the Apple TV. Ah, the joys of portable hand sewing. This was a fun block to make. 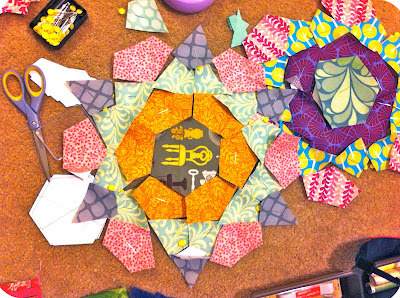 Nothing like a little foundation piecing with paper to complement the English paper piecing. I would definitely recommend giving this block a go with the free template! Ace of Spades Mini Quilt - go VOTE! My final project in May included some needle turn appliqué and embroidery. This project included fabric rescued from my Mom's stash, ironing board cover, linen, and a little gold lamé in addition to some of my favorite prints. This was a great exercise is sewing with other mediums, and you can still VOTE FOR ME on Sew Happy Geek for at least a few more hours. I can't believe I've made six quilts this year (not including the minis). 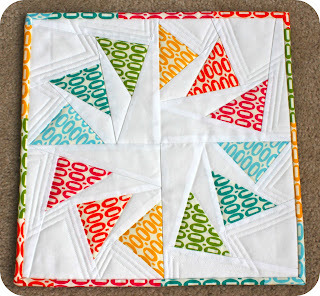 Shocking admission: I've never kept a quilt I've made. That really needs to be rectified. I also really need to finish the quilt pattern I've been working on and get an Etsy shop open. June could be an exciting month! How was your month of May? Do you have big plans for June?! 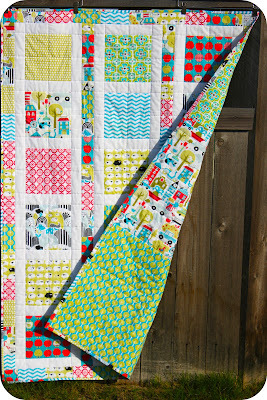 I'm linking up with Lily's Quilts Fresh Sewing Day and amylouwho's Fresh Sewing Friday. 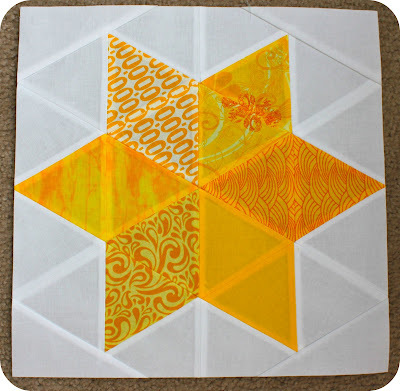 Wow ...your 6 pointed star block is really cool. Thanks for sharing!! Great projects! Your baby quilt is super cute! 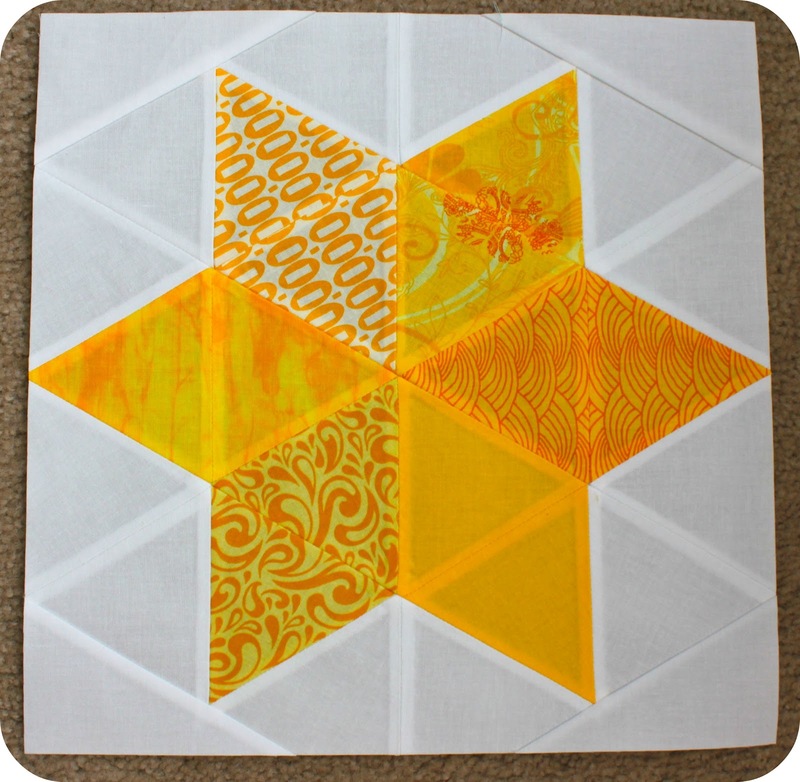 And I love that rose star block - I think you have inspired me to try another hand piecing project. your pezzy print geese is my favorite....i love it! the quilt is adorable. what pattern did you use for that? Thanks so much! I basically winged the quilt with the fabrics that were provided, too me. I'll shoot you an email with more details! Such a great month - well done! The pezzy flying geese were my favorite, though that top quilt is gorgeous too. I think your projects are cute, even the planned rose ones. I really like your flying geese! 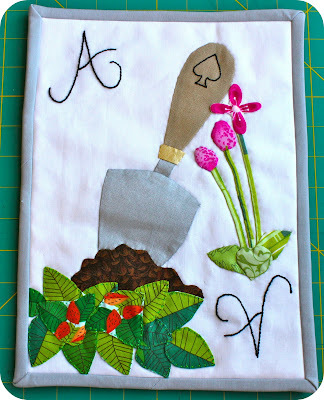 I love this monthly linkup, since I never think I've done much either, then I look back and think "wow"! I'm seriously in love with your ace of spades mini, it's too clever and cute! Did you use a pattern for the six pointed star?